While everyone is aware of the price war in the telecom industry, a lot is happening in the Internet Service Providers (ISP) space as well. Recently several ISPs have introduced new plans and are trying to gain a larger share of the high-speed broadband space. Vodafone India has recently completed the acquisition of YOU Broadband, one of India’s leading ISP, and is scaling it up to new heights. YOU Broadband announced new competitive plans in November that will be a delight to all types of customers viz. new-to-broadband and customers of other ISPs. YOU Broadband has launched plans starting at an attractive price point of Rs 999 wherein the customer gets high-speed (100 Mbps) broadband for one month, free-to-use Wi-Fi router and free installation. In several cities, they are also offering their flagship 100 Mbps plans and unlimited plans at this price point. After completion of one month, the customer can choose any plan that suits his need and continue using the Wi-Fi router. They are running this offer for a limited period only and are likely to discontinue it in December. Several customers are new to broadband and find the free Wi-Fi router, and installation offers attractive because it gives them a chance to experience the service before committing for a long term. Also, there is a large section of customers that already have a broadband connection, but are not happy with the service/speed being provided. This gives them a chance to try out the service at a low cost and switch their ISP, without the hassles of incurring installation charges and paying for a new router. 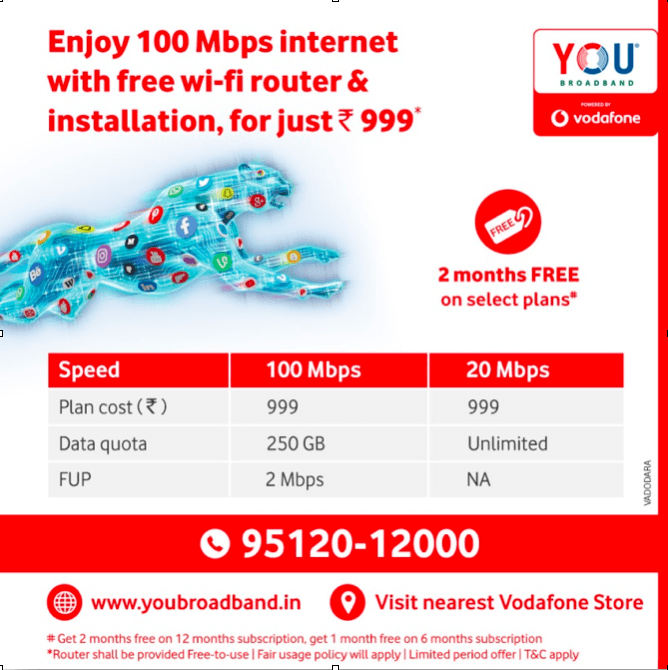 Till recently one could apply for a connection only by visiting their website www.youbroadband.in, mobile app or their call centre; however, now in locations where YOU Broadband is available, one can also avail this offer by visiting the nearest Vodafone store to get a new YOU Broadband connection. Hathway provides much better than this at the same price.1 TB, 150mbps and free wifi router. I have been using this plan for the past 5 months.